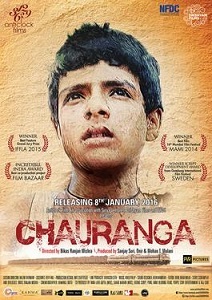 Watch Chauranga because it is honest, provocative and piercing. It announces the advent of a promising new voice in Mumbai’s independent cinema. So on an overall basis 'Chauranga', despite of being a part of various film festivals, ends up being yet another half baked product type of film which caters only to film festival type of audience. This is not an easy watch, but definitely an important one. Performances apart, 'Chauranga', is laced with a powerful message, is delivered in a somewhat convoluted manner, through a haphazard screenplay. Sanjay Suri’s social drama is a mirror to our society with a few jagged edges! In fact, Chauranga is interesting in how it shows that a disadvantaged woman could use the exploitation to her own advantage, being more proactive than her mute upper caste counterparts. The sound handled by Arun Nambiar and Tanmay Das is brilliant and probably the highlight of the film. The film fails to leave an impact on the viewers.